Charlotte Bronte published Jane Eyre on October 16, 1847 under the pseudonym, Currer Bell . The American edition appeared a year later. The novel follows the classic Bildungsroman genre; structured as a coming-of-age story where Jane Eyre progresses from a young orphan into a woman; the reader follows the heroine's character development, emotional travails, and moral development. 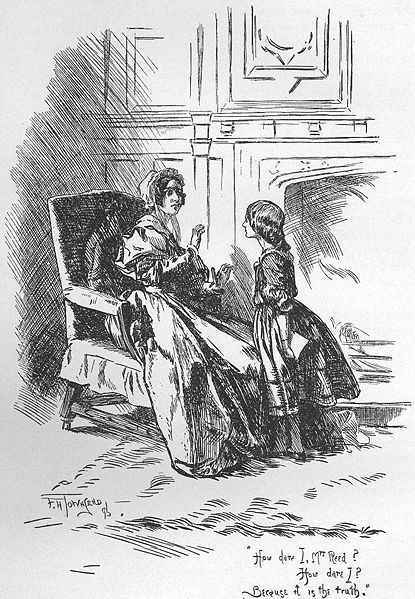 Jane Eyre 's setting is an unspecified location in northern England, presented as five distinct stages: 1) Jane's childhood where, as an orphan at Gateshead Hall she is tormented by her cousin John; 2) She is then sent away to a charity school, Lowood School ; 3) Her governorship at Thornfield Hall where she falls in love with Edward Rochester ; 4) Her time with the Rivers family where she receives her first marriage proposal; and finally; 5) Her reunion and marriage to her beloved, Rochester . Charlotte Bronte dedicated the novel to William Makepeace Thackeray . It remains on many high school reading lists, and is featured in our Feminist Literature Study Guide. Return to the Charlotte Bronte library.